Trearddur Bay VillageTrearddur Bay is a village south of Holyhead on the west coast of Holy Island off the north-west coast of Anglesey. 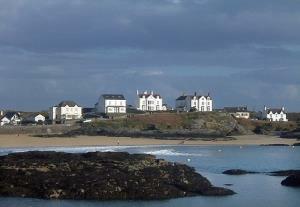 The historical name for Trearddur Bay is Towyn Capel or Tywyn y Capel. On the two beaches (Porth Dafarch and the main beach) there are some shallow scuba diving sites; the main beach is one of the most popular on Anglesey. There is excellent sea fishing in the area and boat trips and fishing trips are available from the beach. Horse riding is available, as well as an 18 hole golf course. Trearddur Bay is a village south of Holyhead on the west coast of Holy Island off the north-west coast of Anglesey. The historical name for Trearddur Bay is Towyn Capel or Tywyn y Capel. A55 Junction 2 & A5153/B4545.